Google abused its dominant position in the search engine market to illegally promote its comparison shopping service, the European Union's top antitrust authority ruled Tuesday, slapping the company with a €2.42 billion (US$2.72 billion) fine. The consequence could be still greater differences in the ways Google presents search results to users in the U.S. and to those in the EU. The European Commission gave the the company 90 days to change its ways or face additional fines of up to 5 percent of average daily worldwide sales of parent company Alphabet for each day that the infringement continued. The Commission's ruling targets the way Google uses its search service to promote another service, "Google Shopping", previously known as Google Product Search and Froogle. Google gives its own service a prominent place in its general search results, above that of rival comparison shopping services, the Commission said, noting that even the most highly ranked competing service appears on average only on page four of Google's search results. "As a result, competitors are much less likely to be clicked on," said EU Competition Commissioner Margrethe Vestager, during a news conference Tuesday. Google responded: "People usually prefer links that take them directly to the products they want, not to websites where they have to repeat their searches." Competitors saw their traffic drop by as much as 90 percent as a result of Google's behavior, Vestager said, while Google gained revenue by driving visitors to its own service. "It denied other companies the chance to compete on the merits," she said. Shivaun Raff, CEO and cofounder of Foundem, the lead complainant in the case, welcomed the Commission's decision to prohibit Google's actions. "Although the record-breaking €2.42 billion fine is likely to dominate the headlines, the prohibition of Google’s immensely harmful search manipulation practices is far more important," she said. Vestager said it was up to Google to decide exactly how to comply with the ruling. "Google cannot simply stop what it is doing now and replace it with similar practices that have the same anticompetitive effect," she said, warning the company that Commission would monitor its behavior closely for a number of years. The Commission analyzed 5.2 terabytes of search results, the equivalent of 1.7 billion search queries, in coming to its conclusion, she said. It also conducted experiments to see whether users' preferences for top search results was linked to their relevance, or just their position in the list, and found that the same result, when moved from first to third place, received significantly fewer clicks. Vestager also warned that the promotion of Google Shopping may not be the only way in which Google is abusing search to promote its other specialized search services, including images and local travel. "We have proven that Google is a dominant company in general search. That will be the starting point for our analysis of these other services," she said. The search case is not the only one the Commission has open against Google. It is also investigating its AdSense advertising platform, and its promotion of apps and services related to its Android operating system. "Our preliminary conclusion in relation to both practices is that they breach EU antitrust rules," Vestager said. 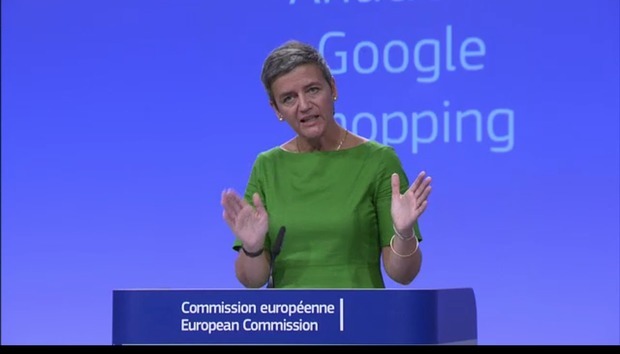 She invited Google to compete on its merits, and to make the most of the EU market of 500 million consumers.